RNA is both the bridge between DNA and the production of proteins that carry out the functions of life and what guides which and how much protein gets made. As messenger RNA (mRNA) is transcribed from DNA to carry genetic information out of the nucleus, segments that don’t code for actual proteins need to be removed from the RNA strand and the remaining pieces spliced together. Different pieces of the expressed gene (exons) are cut out, and these sections are joined together to form the final mRNA strand. Cells gain their ability to produce proteins with various functions by using variations of this splicing. Researchers at the University of Pennsylvania and the University of California study how this splicing occurs in T cells and how it is regulated by multiple proteins. A new study published in the Proceedings of the National Academy of Sciences from the lab describes a cascade of events that may explain changes in gene expression that occur during the development of the human immune system. The team state that an understanding of the patterns and mechanisms of alternative splicing is essential for a full comprehension how the genome is interpreted under different conditions to affect protein function. Alternative splicing is a key mechanism for gene regulation that is regulated in response to developmental and antigen signaling in T cells, explain the team. However, the extent and mechanisms of regulated splicing, particularly during T-cell development, have not been well characterized. T cells need all kinds of new proteins to go through the necessary alterations to fight infections or mature. The cells do this two ways, turn new genes on to produce new proteins or change how mRNA is spliced together to get different forms of the same proteins. These two mechanisms can work separately or together in a cell. In the current study the team demonstrated that the expression of an RNA binding protein called CELF2 is increased in response to T-cell stimulation such as occurs in response to circulating antigens from foreign microbes or tumors. For example, T cells go through changes that ramp up division and proliferation and express gene products such as cytokines to help fight infections. The increase in CELF2 expression drives widespread changes in mRNA splicing in cultured T cells and correlates with changes in mRNA splicing during T-cell development, which occurs in the thymus. Using next-generation sequencing, the team catalogued the splicing pattern of 5,000 exons and looked for the changes in pattern in stimulated versus unstimulated T cells to see how the overall complement of proteins made had changed. The data finding showed that these differences in splicing can lead to physiologically important changes in proteins, whether the protein functions in the nucleus or the cytoplasm, or which other molecules it can interact with. The researchers believe that this paper is the first to catalogue splicing changes during T cell development. The take-home message, state the team, is that the increase in CELF2 expression drives a large proportion of splicing changes that occur during T cell activation and also T cell development in the thymus when humans are young. These results provide unprecedented insight into the regulation of splicing during thymic development and reveal an important biologic role of CELF2 in human T cells. 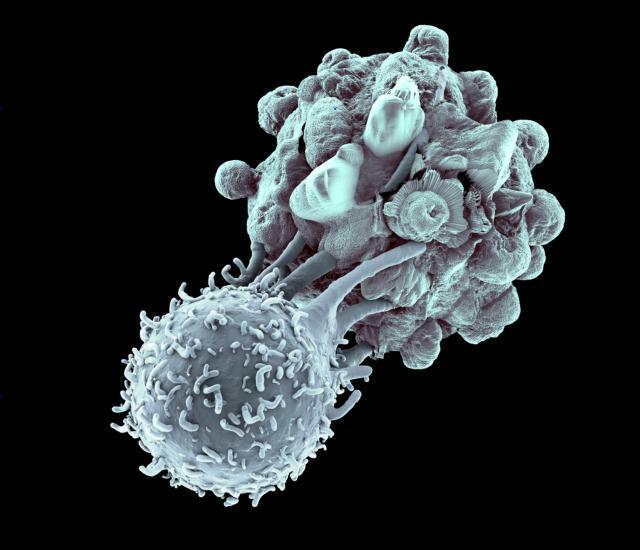 A killer T cell lymphocyte (bottom) is attacking a cancer cell (top). Credit: Coneyl Jay/Stone/Getty Images.